Those of you who have been following me online for a while might remember my previous forays into yoga. I’ve tried a few different times now to practice this form of exercise regularly. I love the idea of becoming more physically flexible than I currently am. Yoga seems like it should fit in well with my current weightlifting and walking routines. 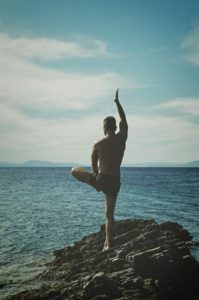 Why did I stop practicing yoga the first few times I tried it? Simply put, I got bored. Yoga isn’t exciting like lifting weights. There aren’t many tangible markers of your progress with it like there are when you move up to a heavier set of weights or suddenly find it easier to lift up grocery bags filled with canned goods. Yoga doesn’t make your pulse race like cardio exercise either. I’ve never felt out of breath while doing it or wondered how much more I should be pushing my heart-rate up before backing off for a while. The same thing could be said of a lot of things, though. I lifted weights for quite a while before I saw any big results with them, and I am able to walk briskly and to dance for much longer periods of time than I could when I first got back into regular exercise. Yoga isn’t any different from those things, so I think I’m going to be giving it another try. How do I hope to succeed this time? By picking a different introduction to it. Part of my problem was that the first few Youtube series I’ve tried for people who are new to yoga weren’t very interesting. The instructors in them spoke in quiet, m onotone voices, and they often moved from one pose to the next without explaining what they were doing. By ignoring the little voice in my head that complains about being bored. Sometimes I get bored when I mediate, too, but that doesn’t stop me from plugging away at it. This isn’t a case of me being ethically or physically uncomfortable with what I’m asking my body to do, so I’m going to try to push through my initial reaction to see if I can find the good parts of yoga. By focusing on the parts of it I do like. One of the reasons why I’m so interested in getting back into this type of exercise is that stretching certain muscles feels really good. I especially like the stretches that involve gentle twisting my calves and lower legs in general in certain directions.That isn’t a part of my body that I spend a lot of time thinking about, but I expect a lot out of it and enjoy being able to flex them. By trying again if this attempt doesn’t work. While I sincerely hope that this will be the time that this form of exercise starts to feel more exciting to me, I’m also prepared to regroup and try again later if it doesn’t work out. I will keep all of you updated on my progress.